Childcare in the UK: the tightest and most expensive? "Under Labour our nurseries became the priciest in Europe." "The real cost of child care, which every family in this country faces, has risen by 77% in real terms since 2003, and child care inflation is going up by 6% every year... At present, we have the tightest ratios in Europe for children under three." "The UK has some of the most expensive childcare in Europe as well as the tightest ratios and the government is committed to improving accessibility to high-quality childcare." Last week an episode of Newsnight revealed that the Deputy Prime Minister Nick Clegg had raised concerns over the Government's plan to allow a greater number of children per adult in nurseries. If the plans were to fall through, it could mean that the budget for the childcare programme will have to undergo a review. The Childcare Minister Elizabeth Truss was in the House of Commons yesterday defending the Government's plans, which are intended to drive down childcare costs. A few weeks ago she was quoted in the Daily Mail eulogising French nurseries. So how do our nurseries compare to the rest of Europe? And are they really so expensive? Let's take a look at the evidence. 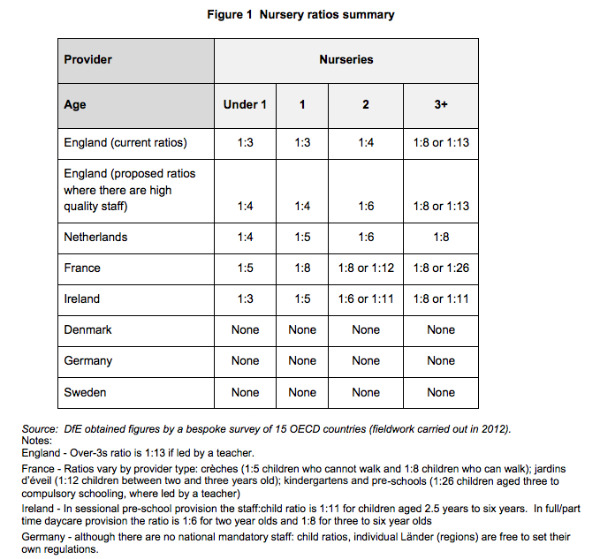 "The ratio for two-year-olds in England is 4:1, whereas it is 6:1 in Ireland, 6:1 in Germany and 8:1 in France, while in Denmark and Sweden—countries that the shadow Secretary of State has explicitly advocated—there are no national staff ratios at all." So Liz Truss was correct to point out that the UK's staff-to-child rules are more stringent than other European countries, although there are some variations in how each country actually implements their ratios. "a mismatch of supply and demand across the country, with sizeable vacancies in day care, out-of-school and childminder places in some areas and heavy shortages in others." A report by Ms Truss for the think-tank Centre Forum suggests that our child-adult ratios are one of the reasons why the UK is failing to secure value for money. Others, however, have expressed scepticism over this claim, while in a survey carried out by the National Children's Bureau, 95% of respondents said they were concerned about increasing ratios. 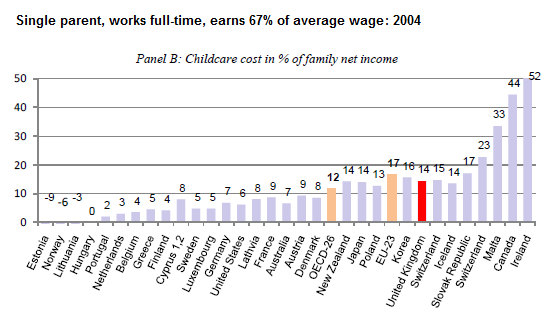 So how are we doing with childcare costs? Every year the Daycare Trust publishes a Childcare Costs Survey, compiled from figures submitted by Family Information Services. The survey found that the average cost of a nursery place for a child under two is now £4.26 per hour across Britain (£5.33 per hour in London). So a parent buying 50 hours of childcare per week would face an average annual bill of around £11,000 per year. 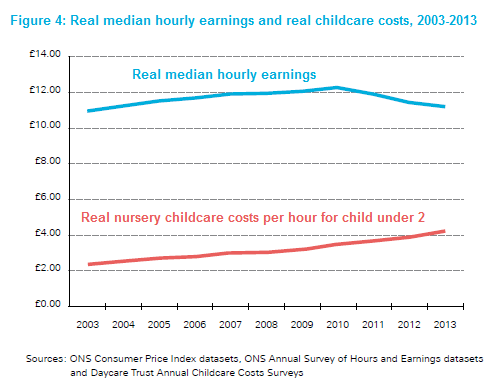 The survey also shows that childcare prices are rising at "significantly above" inflation in England. Costs for after-school clubs, nursery and childminder places for the over-twos rose by more than 5 per cent over the last 12 months. As Liz Truss claimed in Parliament, the survey found that a nursery place for a child aged two or under is now "77 per cent more expensive than it was in 2003". The graph below illustrates how the growth in childcare costs has risen since 2003, whilst the real terms average wage has fallen. When considering childcare costs, the OECD's family database includes fees less financial assistance, such as cash benefits, rebates and tax concessions. It also looks at gross childcare costs, net childcare costs as a percentage of family income or as a percentage of the average wage. 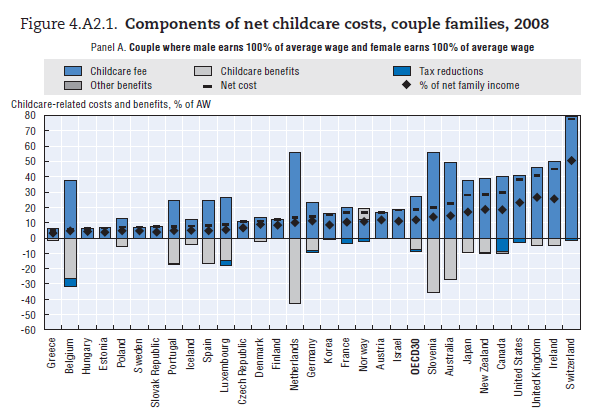 The charts below (for two different family types) confirm that net childcare costs (taking benefits into account) are relatively high in the UK compared to other countries, and almost the highest for certain dual-earning couples. 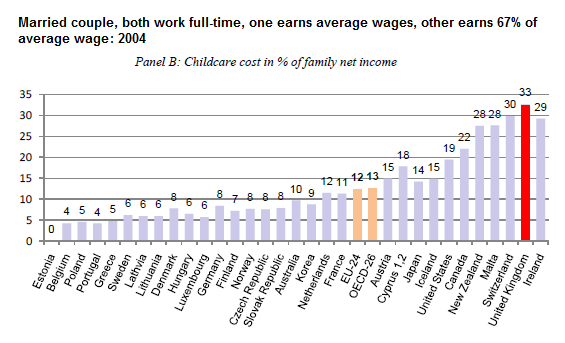 It was published by the OECD in 2010, but it uses data from 2004. So there's some evidence to suggest that childcare costs were among the 'priciest' in Europe in 2004, but as yet it isn't clear how the Daily Mail established that childcare became the priciest under Labour, as we weren't able to find figures prior to 2004. Tax-free childcare: will parents be better off?